Popcorn is also Gaby's favourite snack to take to school, so we always leave a bit from the night before so she can pack it to go in the morning. 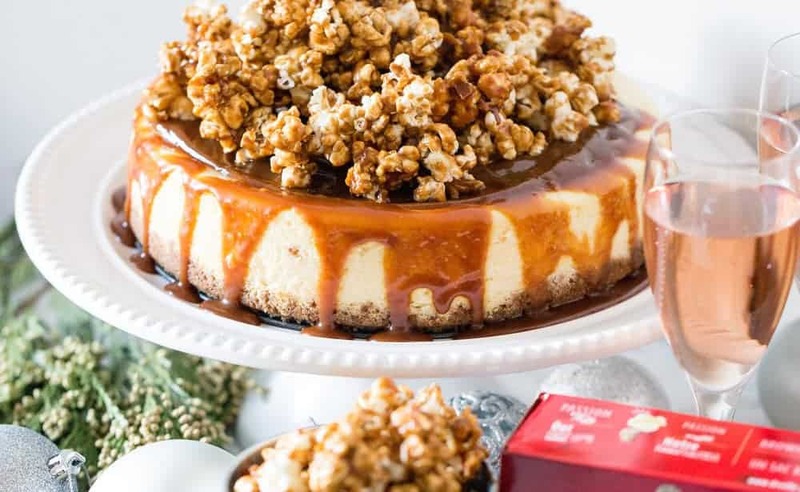 With the holidays almost here, I decided to make a cheesecake topped with our favourite snack. After all, the holidays are the time when there's always a dinner party or a get together to host or to attend. Popcorn is also Gaby’s favourite snack to take to school, so we always leave a bit from the night before so she can pack it to go in the morning. 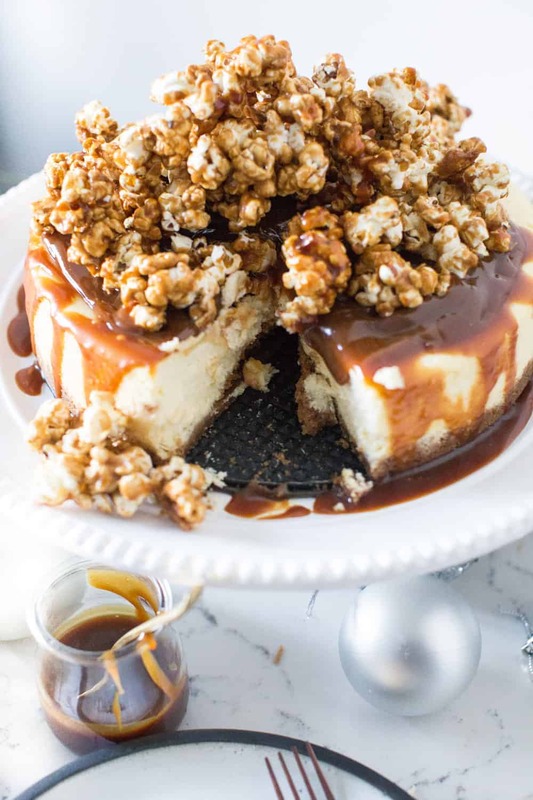 With the holidays almost here, I decided to make a cheesecake topped with our favourite snack. 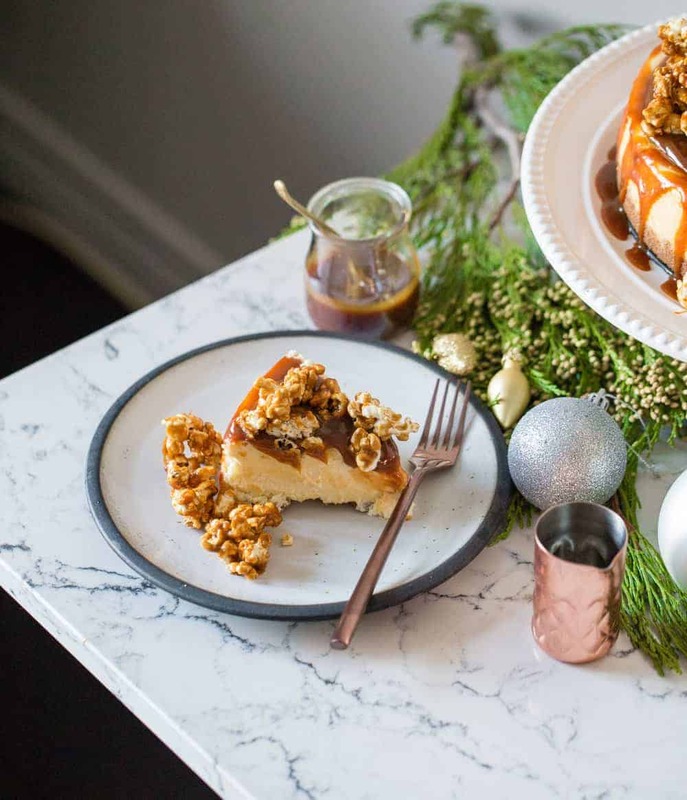 After all, the holidays are the time when there’s always a dinner party or a get together to host or to attend. 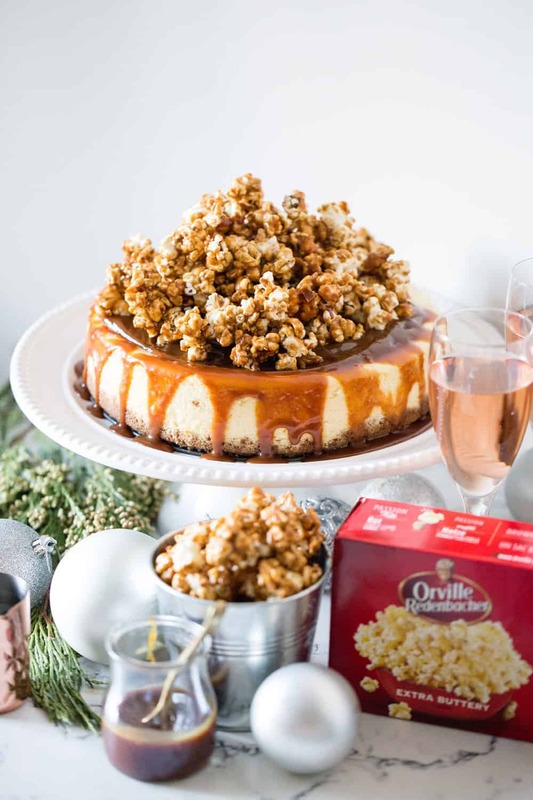 So whether this is the first cheesecake recipe you are trying, or if you are like me, you have to bake a few each year, I wanted to share with you some tips to set you up for cheesecake baking success. This is crucial. If you bake at 300 F or 350 F, the cheesecake will cook too fast, once again creating cracks in the middle of it while baking, and once chilled will have a denser texture. 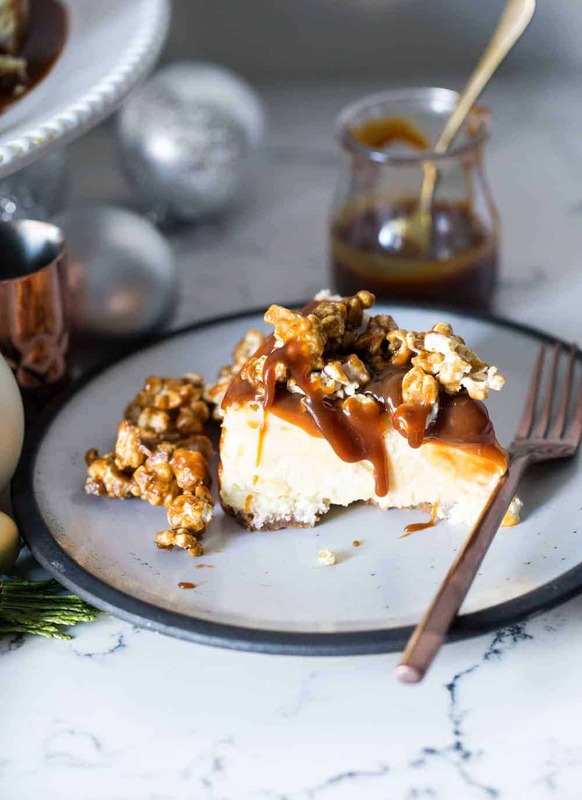 To make sure your cheesecake comes out perfectly smooth, creamy and free of any cracks, bake it at 250 For an hour and 10 minutes and let cool completely before refrigerating overnight. 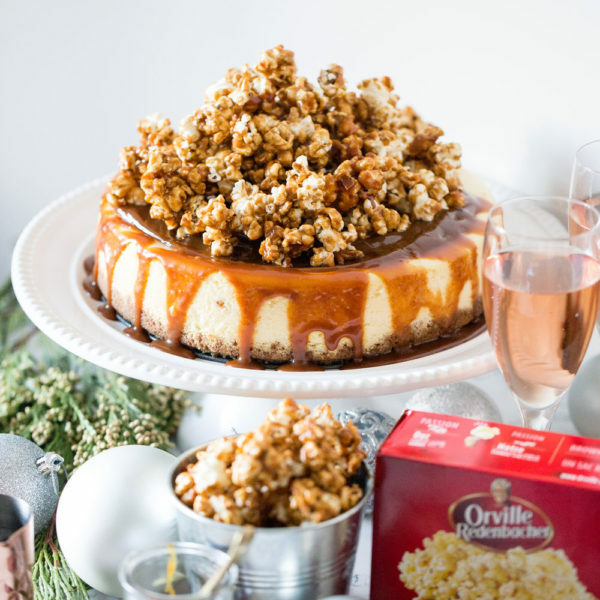 Topping this Dulce the leche cheesecake with Carmel popcorn might seem indulgent, but hear me out. Desserts have always been a celebration in itself. My food philosophy has always been to use moderation, work out regularly, eat healthy and wholesome meals made at home, and to enjoy life throughout, but when it comes to desserts, go ahead and make something Julia Child would be proud of. 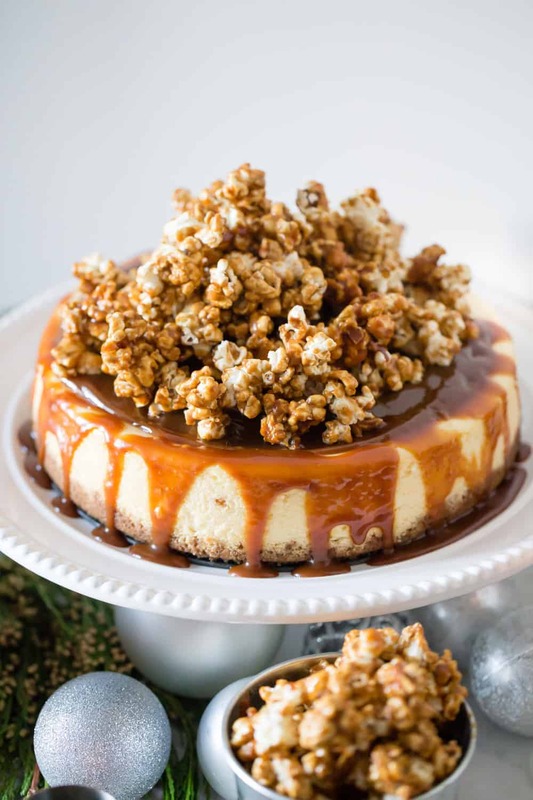 The recipe below has 3 steps, you will be making your cheesecake the night before and then leaving the caramel popcorn and salted caramel sauce to be made on the day you’re serving it. For this recipe I’ve chosen Orville Redenbacher popcorn, our brand of choice at home because it tastes just like the popcorn you get at the movies. Fresh, delicious and flavourful. The best part is that Orville microwave popcorn is now made without artificial colours, flavours or preservatives, has the added bonus to be high in fiber and is gluten- free and non GMO, like all popcorn. 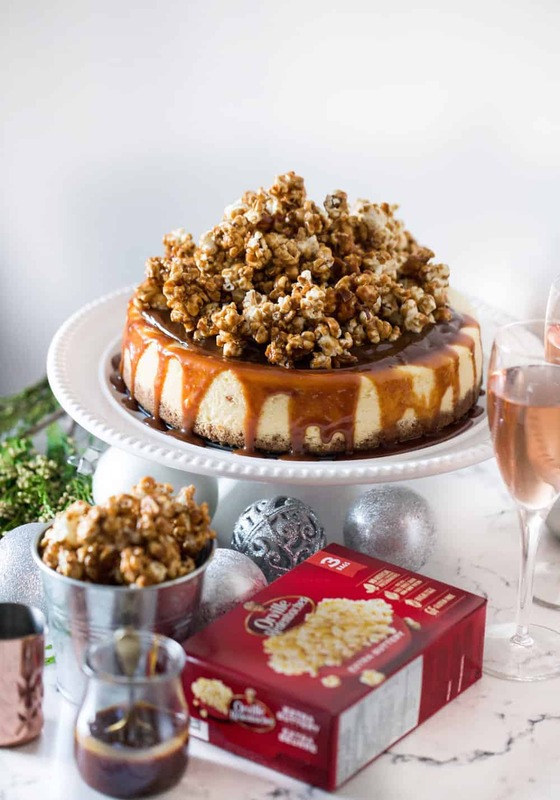 Besides being our favourite night time snack at home, in this recipe where it truly shines, adding crunch and fun to this cheesecake. So now, let’s get started! To make the crust, put the graham crackers into a sealable plastic bag. Press out all the air and seal the bag. Using a rolling pin, gently but firmly crush the crackers to make tiny crumbs. You should have 1 1/2 cups crumbs. Put the butter in a small saucepan and melt over medium-low heat. Using a pot holder, move the pan to a heatproof surface. Using a wooden spoon, stir in the graham cracker crumbs and sugar and cinnamon. Scrape the crumbs into a 9-inch springform pan. Lay a piece of plastic wrap loosely over the crumbs. Place your hand on the plastic wrap and spread the crumbs evenly over the bottom of the pan. Press down firmly to make a solid, even layer. Bake the crust at 300 F for 8 minutes, set aside and let cool. In a large bowl, using an electric mixer, beat the cream cheese, flour and salt on medium speed until fluffy and smooth, about 3 minutes. Turn off the mixer and scrape down the sides of the bowl with a rubber spatula. Add the sugar, sour cream and vanilla and beat on medium-high speed until smooth. Stop and scrape down the sides of the bowl. Add the eggs one at a time, beating well on medium-high speed after each one is added. Preheat the oven at 250 F, pour the cheesecake batter into the cooled crust, put the pan in the oven and bake for 65 to 70 minutes. To test for doneness, using oven mitts, nudge the pan; the center of the cake should jiggle slightly. Using oven mitts, remove the pan from the oven, set it on a wire rack and let cool completely. Cover with plastic wrap and refrigerate until cold (overnight is best). Loosen the clasp on the pan sides and remove the sides. Slip the metal spatula between the crust and the pan bottom and slide the cake onto a cake stand. Pre-heat oven to 250 degrees. Stir together the popped popcorn , spread out on a parchment-line rimmed baking sheet and set aside. In a medium saucepan, melt the butter over medium heat. Stir in the corn syrup and sugar with a wooden spoon, turn the heat up to medium-high. Stirring constantly, bring to a boil .Boil for about 4 minutes. Remove from the heat and immediately stir in the salt, baking soda, and vanilla. Pour the caramel over the popcorn mixture – taking care to stir and evenly coat the popcorn. Spread out into an even layer and bake for about 45 minutes, stirring every 15 minutes. Remove from the oven and let rest until cool enough to handle. Pile on top of the cake before serving, Use salted caramel sauce to help stick together, if necessary. Remove the pan from heat and slowly pour the cream. Again, mixture will bubble vigorously, keep stirring until the cream is fully added. Finish the sauce by adding the sea salt. Transfer to a glass container. Set aside. Top the cheesecake with the Dulce de leche and spread evenly. 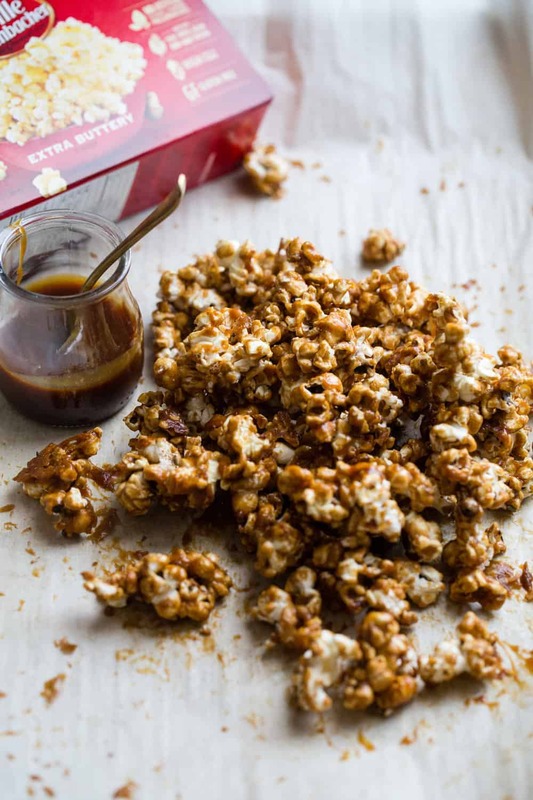 Pile with the caramel popcorn and drizzle with the salted caramel. This post was made in collaboration with Orville, however all views, recipe creation and opinions are my own.